Downloadable costumes for Tales of Xillia are coming soon! Just like Tales of Graces, Tales of Xilia for PlayStation 3 will have lots of downloadable costumes for its characters.. 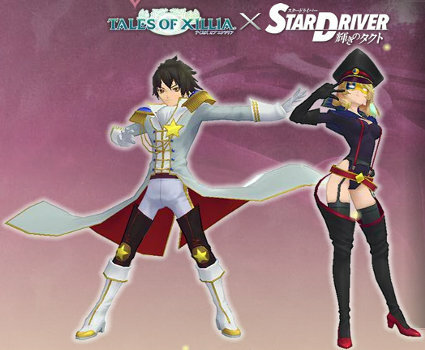 According to a leaked information from Tale Tale Source, the first batch of costume that will be released is the Star Driver outfits. These downloadable costumes will be release on September 8 along with the game release. This will cost 500 yen each. If a player wants to have all six, this will cost them 3,000 yen. Meanwhile, the Idolm@ster costumes and the swimsuits for the three leading ladies of the game will be released on September 15 for 300 yen per piece. School outfits, on the other hand, are set to be released on September 29 for 300 yen as well. However, the launch date for the maid and butler costumes are still not set. Moreover, the pre-order classic Tales costumes included in the Ayumi Hamasaki single will cost 7,500 yen ($98).